Description: The Bible and the Sacraments dives into the mystery of these God-given channels of grace. It illuminates the deeply scriptural roots of the sacraments, examining the rich relationship between the Old and the New Testaments and their connection to the rites of the Catholic Church. Moderated by Paul DeBruyne with video presentation by Matthew Leonard, Vice President of the St. Paul Center for Biblical Theology. We will meet on Wednesday mornings from 9:45 to 11:15 am between February 20 and May 1, 2019 after the Prayer Service. Registration forms are available in the Narthex. For more information please contact Paul at padebruyne@icloud.com or at (815) 218-6436. Description: Are you new to the area or would you just like to meet others from Queen of Apostles? Come join us for coffee. Meet us at Four Star Restaurant (120 Simmons Ave, Pewaukee, WI 53072 - next to the Pewaukee Post Office) , 1st Thursday of every month, at 10:15 am. Dutch treat, no format, just an informal get-together. Call Gayle (414) 429-0212 or Pat (501) 574-8094 with any questions. Description: Alpha is a series of sessions exploring life and faith. Alpha is run around the world and everyone is welcome – high school seniors and senior citizens -- people of no faith and lifelong Catholics. Most Alphas have three key things in common: free food, an inspiring video, and good conversation. Description: The choir rehearsal meets in church every Thursday at 6:30 pm. If you are interested in joining, please contact the Director of Music & Liturgy, Brian McLinden, at (262) 691-1535 x103. Description: First Fridays of the month immediately following Mass. Description: The Prayer Shawl Ministry meets the 2nd Monday of each month in Grellinger Hall. Everyone is welcome to join! Any questions? Call Liz White at (262) 312-0815. Description: Everyone is invited to attend Common Meeting Night on the second Wednesday each month at 6:30 pm in Grellinger Hall. All the various commissions (Life-long Faith Formation, Prayer & Worship, Human Concerns, etc.) meet and report what's going on within their commission. Description: Sooner or later, everyone faces the loss of a loved one. Our “Bereavement Ministry” Team invites you to join us in monthly meetings of care, support and understanding for anyone grieving a loss. We meet the 2nd & 4thThursdays of each month from 10:00 to 11:30 a.m. in the Conference Room at Queen of Apostles Catholic Church, N35 W23360 Capitol Dr., Pewaukee. Find us at: www.queenofapostles.net or call Gayle (414) 429-0212 or Pat (501) 574-8094 for more information. Description: The Environment Team is looking for volunteers to help set up for Palm Sunday. If you are able to volunteer, please come to church at 10:00 am. Description: The Environment Team is looking for volunteers to help set up for Holy Thursday. If you are able to volunteer, please come to church at 10:00 am. Description: Join us in church for Holy Thursday Mass. Mass will be followed by Eucharistic Adoration until 10:00 pm. Description: The Environment Team is looking for volunteers to help set up for Good Friday. If you are able to volunteer, please come to church at 9:30 am. Description: The Environment Team is looking for volunteers to help set up for Holy Saturday. If you are able to volunteer, please come to church at 9:30 am. Description: There will be a blessing of Easter foods in church at 10:30 am. 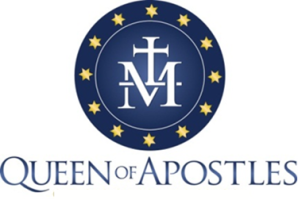 Are you new to the area or would you just like to meet others from Queen of Apostles? Come join us for coffee. Meet us at Four Star Restaurant (120 Simmons Ave, Pewaukee, WI 53072 - next to the Pewaukee Post Office) , 1st Thursday of every month, at 10:15 am. Dutch treat, no format, just an informal get-together. Call Gayle (414) 429-0212 or Pat (501) 574-8094 with any questions. The choir rehearsal meets in church every Thursday at 6:30 pm. If you are interested in joining, please contact the Director of Music & Liturgy, Brian McLinden, at (262) 691-1535 x103. First Fridays of the month immediately following Mass. The Prayer Shawl Ministry meets the 2nd Monday of each month in Grellinger Hall. Everyone is welcome to join! Any questions? Call Liz White at (262) 312-0815. Everyone is invited to attend Common Meeting Night on the second Wednesday each month at 6:30 pm in Grellinger Hall. All the various commissions (Life-long Faith Formation, Prayer & Worship, Human Concerns, etc.) meet and report what's going on within their commission. Sooner or later, everyone faces the loss of a loved one. Our “Bereavement Ministry” Team invites you to join us in monthly meetings of care, support and understanding for anyone grieving a loss. The Environment Team is looking for volunteers to help set up for Palm Sunday. If you are able to volunteer, please come to church at 10:00 am. The Environment Team is looking for volunteers to help set up for Holy Thursday. If you are able to volunteer, please come to church at 10:00 am. Join us in church for Holy Thursday Mass. Mass will be followed by Eucharistic Adoration until 10:00 pm. The Environment Team is looking for volunteers to help set up for Good Friday. If you are able to volunteer, please come to church at 9:30 am. The Environment Team is looking for volunteers to help set up for Holy Saturday. If you are able to volunteer, please come to church at 9:30 am. There will be a blessing of Easter foods in church at 10:30 am.